It’s a right of passage for tourists and holidaymakers to stop in at the township of Russell while they’re in the Bay, and for good reason. This seaside township is a true delight. Russell is one of the country’s most significant places in terms of New Zealand history, being our very first seaport, the first European settlement and New Zealand’s first capital in nearby Okiato. But it’s also famous for its charm. As you stroll around the quaint township, you’ll see that New Zealand’s colonial history has been beautifully conserved. Visitors say it’s like stepping back in time. 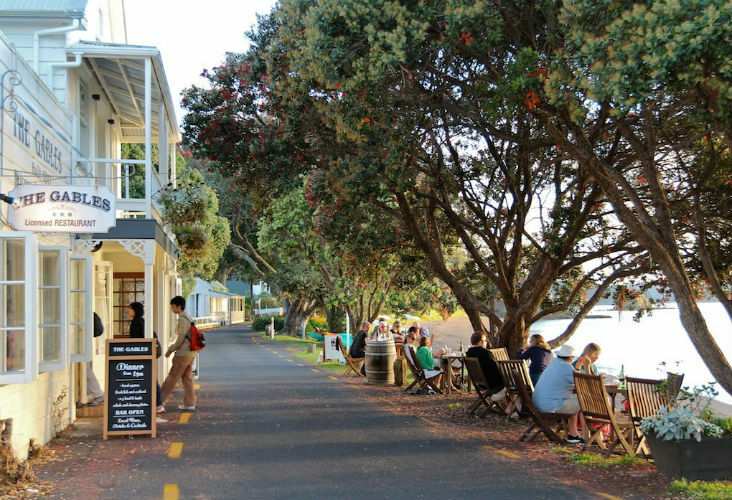 Watch a sunset from the balcony of the historic Duke of Marlborough restaurant, enrich your palette at a local winery, or get fish and chips on the beach with the kids – they’ll love the short ferry ride over from Paihia. Here are some more ideas on what to do, see and eat in and near Russell. A stroll around the streets will lead you to the Catholic Mission ‘Pompallier’, New Zealand’s oldest surviving Roman Catholic building. It’s well worth a visit – the award-winning restoration is incredible. Built in 1842, under the direction of architect Louis Perret, it was used as a printery, tannery and storehouse for the French Marist mission. A staggering 40,000 books were printed here in Māori. It’s now a working museum where you can learn about tanning, printing and old fashioned bookbinding. Another building to admire is Christ Church, the oldest existing church in New Zealand. Incredibly, you can still see musket ball holes from the New Zealand Land Wars. The graveyard’s biggest memorial commemorates Tamati Waka Nene, a powerful Ngāpuhi chief from the Hokianga who sided against Hone Heke in the Northland War. Overlooking Russell is the hill where chief Hone Heke chopped down the British flagpole four times. You can drive up, but the view justifies a climb. Just take the track west from the boat ramp along the beach at low tide, or head up Wellington St. The 360 degree views are jaw-dropping. This quaint but modern museum has a great Māori history section, a huge 1:5-scale model of Captain Cook’s Endeavour, and a 10-minute video on the town’s history. Run by the local marae society, Haratu has traditional and modern Māori arts and crafts available for purchase. There are also interesting audiovisual displays and information boards to check out. The centre is volunteer-run, so opening times can vary. South Sea Art in central Russell stocks New Zealand artists, both local and from further afield. The gallery offers framing and shipping services as well as fine prints, oils and sculptures. 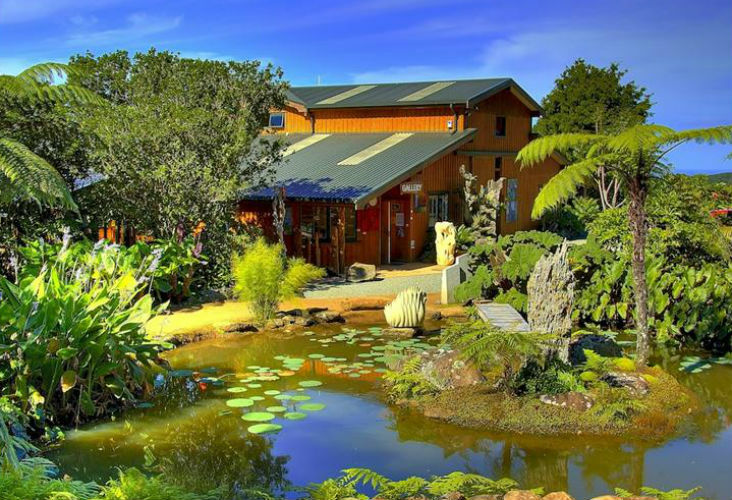 The Gallery & Cafe are set in a lush subtropical garden with magnificent bush and sea views over Helena Bay, which is on the scenic coastal route – so you’ll need a car to get here as it’s about half an hour’s drive out of Russell. The gallery specialises in Contemporary Maori and Pacific Art. They’ve gathered an outstanding collection of paintings, and wood art, handblown glass, carvings and jewellery from top New Zealand artists. Well worth a drive out of town on a warm day. This gallery in the centre of town specialises in art glass, wood sculpture, paintings, and jewellery. They also offer a selection of books, including Maori history and culture as well as art and New Zealand pictorials. These short tours are a great way to see the main highlights of Russell not easily covered on foot if you’re short on time. The small buses feature good guided commentary and leave from the city town centre frequently. Hikoi Tahi provides digital walking tours via an app (Google Play only, not Apple). 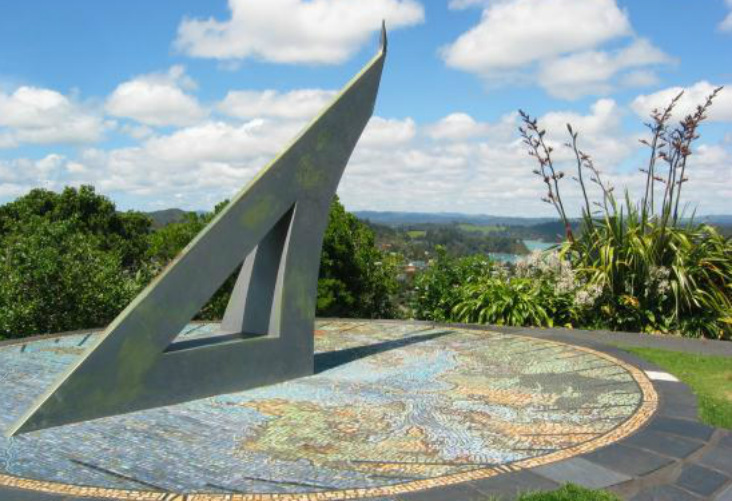 Try their Russell Kororareka Walk or the walk on Flagstaff Hill – they tell stories from a Maori perspective. It’s a great way to walk with local Maori voices telling ‘tūturu’ (authentic stories) which have rarely been shared before. 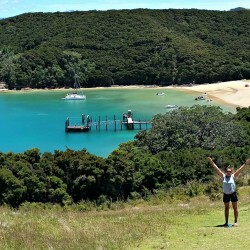 Read our guide for low down on more great walks and hikes in the Bay of Islands region. You could also walk over to Oneroa Bay via Long Beach Road from town. Take a picnic and spend some hours just relaxing at the beach. Bliss! Find out more about local walks, on the Department of Conservation website. Massage is a great way to relax after a long day on the water or out exploring. Try Russell Healing Massage. You can choose to remain indoors, or have your treatment in the lush, private garden! Here are some other local listings for spas and massage in the wider Bay Of Islands area. About 1.5km behind Russell (an easy walk or cycle) is this sheltered, child-friendly beach. The perfect place for a dip! Turn left (facing the sea) to visit Donkey Bay, but cover the kid’s eyes! It’s a small cove that is an unofficial nudist beach. Sailing, cruise boat, fast power boat, ferry or kayak? The choice is yours! There are plenty of options around to explore the water and outer islands and beaches. Highlights usually include dolphin spotting & swimming and heading out to the Hole in the Rock. We’ve collated the top offerings on our website here. 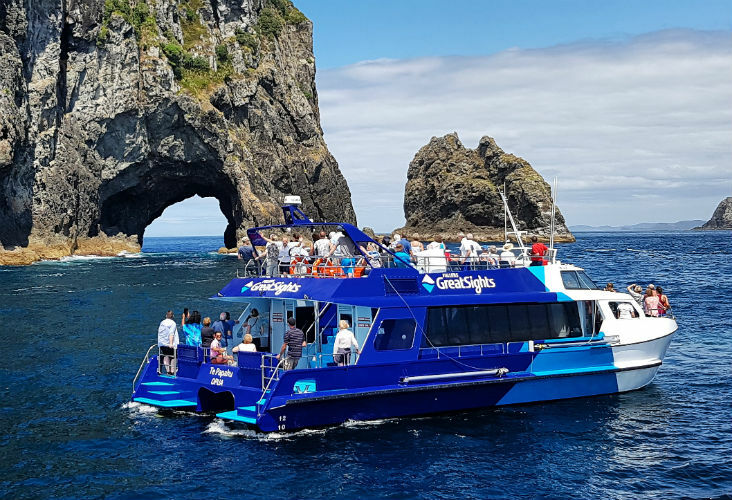 Many of the Bay of Islands daily cruises will leave from Paihia, but make sure to ask if they have a pick up from Russell as well – as plenty do. There are heaps of small charter boats that head out from Russell. We’d suggest heading to the wharf area and seeing whats on offer, depending on the scale of what you’re after. And if you’re into big game fishing you can head to the wharf and catch a game fishing boat to hunt for marlin, tuna, broad bill and sharks. We have compiled a list of our favourite suppliers in the area here. Or we’d suggest reading our in-depth guide to fishing in the wider Bay area. Check out our comprehensive guide to Bay Of Island wineries, or jump straight to our listings. 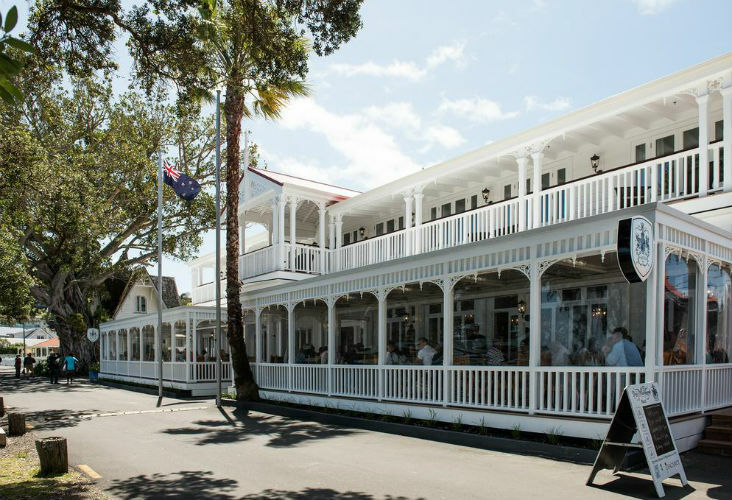 Located on the waterfront of Russell in the Bay of Islands, the Duke of Marlborough Hotel offers an outstanding restaurant, accommodation and event venue. 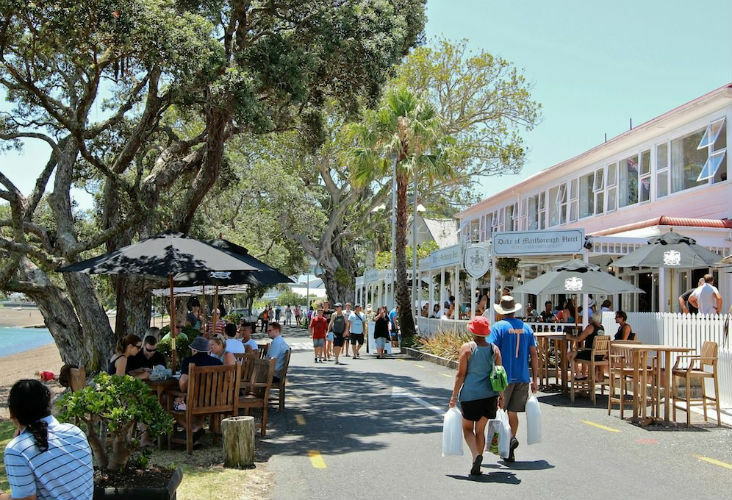 Holding New Zealand’s first liquor licence, this historical beauty has been lovingly restored and offers her visitors a great place to relax, unwind and watch the world go by, right by the sea. And you can always stay the night. Book a table (and or room) on their website. Omata Estate is a boutique vineyard on a sunny peninsular, 8km out of Russell. Their vines grow on north facing slopes overlooking the ocean – and what a view it is! The Omata Kitchen is a relaxed style eatery serving gourmet platters and wood-fired pizzas. They strive to source items locally and menus change often. Grab a wood fire oven pizza or platter now, matched of course to a wine. You can book a spot on their website. This eatery offers authentic wood fired pizzas, local craft beer on tap and boutique wines in a relaxed, sheltered tropical garden. Visit their website for menus and booking. Sage is an Italian restaurant just 15 minutes drive from Russell, at Paroa Bay Winery. Set in an idyllic peaceful setting with beautiful sea views, Sage offers outstanding authentic Italian cuisine made with fresh local ingredients and excellent wines. Check out their menu and contact them for a booking. New Zealand’s oldest operating restaurant, The Gables, offers fine food matched with a great selection of wine right on the waterfront. Take a seat by the window for views over the bay and a glorious Russell sunset. The food here is classic; dishes are designed to showcase New Zealand and particularly the Far North’s outstanding produce. The Head Chef loves using fresh seasonal ingredients, especially local seafood. Check out their menu and book here. Ringed with beautiful coastline, and plenty of water activities, Russell is the perfect summer spot. February is usually the most settled, warmest month to visit. Russell is accessible by road, but the easiest way to visit is to catch a vehicle ferry from Opua (5 minutes), or passenger ferry from Paihia, which takes only 15 minutes. Find out more about the vehicle ferry from Opua. Find out more about the passenger ferry from Paihia. Driving from Paihia will take you around 40 minutes. Driving from Whangarei will take you about an hour. If you prefer simply to sit back and enjoy the scenery, book a coach and be in Paihia in about five hours. Then you can hire a car or catch a ferry to Russell from there. If you want to get straight into your Bay of Islands visit, you can fly from Auckland to Kerikeri in less than an hour. Then it’s an hour’s drive from Kerikeri to Russell. If you’re after a day trip or a spot of dinner – the ferry to Russell is your best option. Once you’re there, explore on foot (or bike!). Most exploring of the historic township can be done this way. Of course, there’s plenty to see on the outskirts of the peninsula, such as beaches and wineries, and some lovely boutique accommodation – in which case driving over is your best bet. Far North Rentals have vehicles for hire and are based across Northland, including at Kerikeri airport and Paihia for pickups. There are plenty of transport or ‘just for fun’ options at Russell Boat and Bike Hire. If you’re in the wider Bay Of Islands area and want to compare hire options, have a look at our local listings. For more detailed info and recommendations about kayaking in the Bay Of Islands, have a read of our comprehensive Kayaking guide. Same goes for boat and yacht cruises: read our guide to sailing in the area. If you’re interested in New Zealand political and social history, or want an insight into early colonialism in the South Pacific, or perhaps want to know more about early European / Maori relations – you’ve come to the right place. The original street plan and town layout are still the same, and you can easily navigate your way to and from some of New Zealand’s oldest and most significant historic buildings using the street signs that remain intact, from 1843. Russell’s name in Te Reo Maori is ‘Kororareka’, which means, ‘The Place of the Sweet Penguins’. According to Maori legend, the town is named after a broth made from the little blue penguin, which was given to a Maori chief who was wounded in battle. When he took a sip he exclaimed, “Ka reka te kororā” (“How sweet is penguin!”). 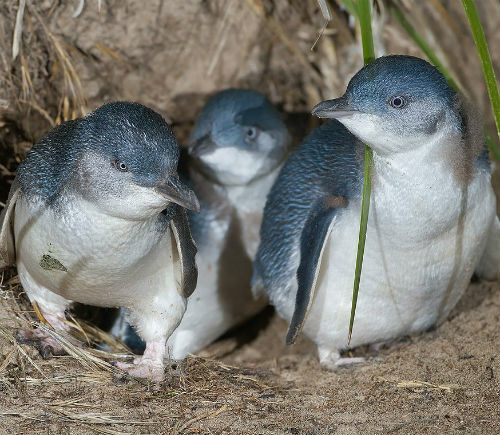 Today, you can catch a glimpse of the little blue penguins after dark on the beach at Russell – they enjoy nesting under the floorboards of the waterfront buildings. Please don’t eat them, despite the legend :o). During the early 1800’s when European settlers were developing the area, Russell was planned and promoted as a shipping town. The population soon exploded with settlers and traders, but also with some more “unsavoury” visitors, like wayward seamen, escaped convicts, and rough-round-the-edges whalers. Booze sellers did a roaring trade and brothels popped up across the area. You can imagine the lawless, drunken bedlam and violence that led to the notorious nickname, the “Hell Hole of the Pacific”. There are plenty of stories to be told about the rowdy antics and colourful characters of times gone by. 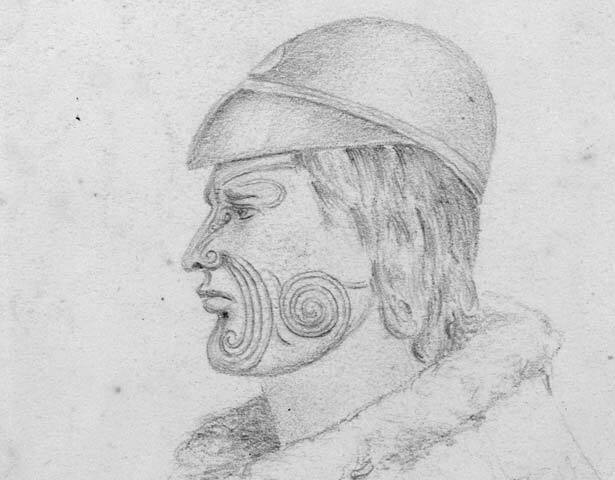 During this period local Maori traded produce, pockets of land and even women for powerful muskets. And so began the violent Musket Wars between iwi (tribes). The resulting, bloody slaughter was colossal. Some tribes were decimated and old boundaries were altered. But thankfully, not everything was “hellish” at this time. The missionaries kept themselves busy building and sharing their faith. The Church Missionary Society built the Anglican Christ Church in 1836, while their rival Bishop Pompallier and the Marist Brothers from France arrived and built their mission and printery on the south end of the beach in 1841. Both sites are still standing and are well worth a visit. 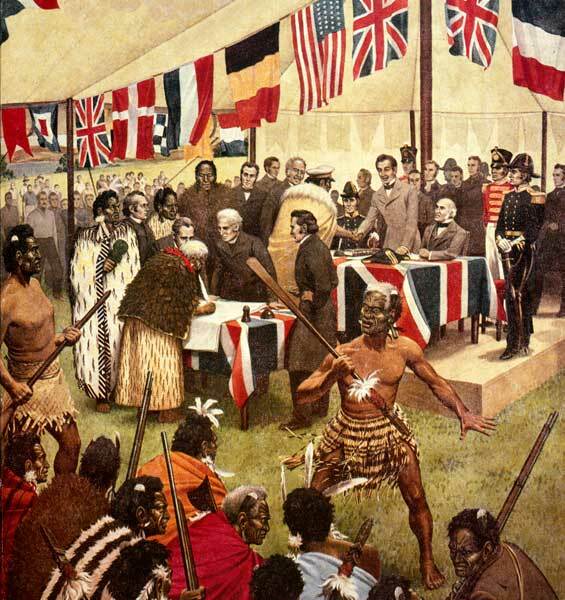 In 1840 one of the most significant events occurred in New Zealand, up in the Bay of Islands in fact: the signing of the Treaty of Waitangi. The Treaty is considered our founding document, and is a written agreement, in both Māori and English versions, made between the British Crown and about 540 Māori rangatira (chiefs). There is much to learn about the Treaty (have a look at the NZ History website for a brief intro). And you’ll soon discover that the Bay of Islands is the perfect place to know more about it. A name you’ll hear a lot up here in the Bay is ‘Hone Heke’ – a Māori chief, who was one of the signatories to the Treaty of Waitangi. Soon after the signing he started to believe the Government was oppressing his people and great injustice had taken place. In 1844 he led a protest by cutting down the flagstaff and the Union Jack flying on Maiki Hill in Russell. The flagstaff was quickly restored, but then it was cut down again – three more times. During a still night in 1845, Heke’s men crept up Maiki Hill toward the British army blockhouse. Other chiefs created a diversion. They attacked the town from two different directions. After a fierce battle lasting a few days, British troops retreated to their ships while Māori took the town. This battle was the first of the Northern Land Wars. Whakakotahitanga – The Flagstaff on Maiki Hill. A new flagstaff was erected on Maiki hill in 1857 and stands there today. The flagstaff was given by the son of Kawiti as a symbol of peace, and called Whakakotahitanga in Māori or ‘Being as one’ in English. 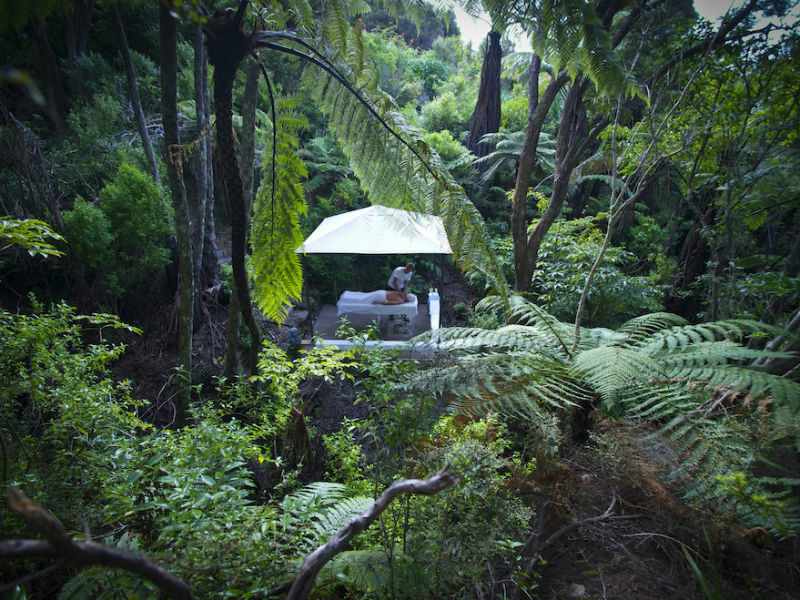 You can walk to the flagstaff through the bush tracks of the Kororāreka Reserve, or drive up. The views are incredible. It flies the United Tribes flag on twelve days each year. With Maori in full control of the area, Europeans stayed away. Trade died off almost completely. But progress was inevitable. The town was rebuilt and continued to serve some shipping routes. Then manganese was discovered nearby, a fish-canning factory was built, and coal mining in the area brought steady trade again. Europeans came back to live during this time, often fishing or farming. Russell was rediscovered as a beautiful place for holidays or retirement, and became popular as a big game fishing spot. But Russell was still hard to access accept by boat in those days. In the 1930’s a road was finally put in – the rugged coastal route now known as the Old Russell Road (thankfully today, there’s a new much faster highway from Kawakawa! ).